Blackstone LaunchPad - March Update! Welcome to the March Edition of our newsletter! It's been a busy month so far and we'll be marching at the same tempo right into April! Blackstone Announcement – Techstars Partnership! Blackstone Foundation – #WeAreEntrepreneurs – Final Month! LaunchBox 2018: Announcing the Winners! Blackstone Charitable Foundation and Techstars announced earlier this month at SXSW EDU that they are teaming up to supercharge Blackstone LaunchPad, the preeminent campus-based entrepreneurship program. Blackstone – #WeAreEntrepreneurs - Final Month! To learn more about the initiative read here! Blackstone LaunchPad at Trinity were very proud to sponsor the 2nd annual meeting of the Trinity Healthcare Entrepreneurship, which took place in the Knowledge Exchange of the Trinity Biomedical Sciences Institute on March 6th. A big congratulations to David Hopkins and the organising team who turned out another very successful event with three brilliant speakers, Dr Jeremy Skillington, Ms Ciara Donlon and Dr John McKeon in front a full audience of students! Check out the photos on their Facebook page here: https://www.facebook.com/pg/THEF18/photos/?tab=album&album_id=360425124365615 Photography by Ben Morrison (University Times). LaunchBox 2018: Announcing the Winning Teams! Mark McGeough is Co-founder & COO of Ekho, a venue engagement platform that allows tourist attractions to manage, deliver and analyse their multimedia content in order to drive deeper visitor engagement and understanding. Both Trinity College Dublin graduates, Mark and his Co-founder & CEO, Raef Tyrrell, founded Ekho in the summer of 2017 with the help of Blackstone LaunchPad at Trinity and plan to launch with The Science Gallery Dublin in April 2018. Check out their blog post on our site below, where Mark discusses the importance of communicating your vision along with other insights from Ekho's entrepreneurial journey! Three of our teams successfully participated in this competition last year, so do check it out! The Ireland Funds has partnered with NDRC to help you bring your idea from concept to pitch. Applications will be accepted until noon on Wednesday, 25th April 2018. 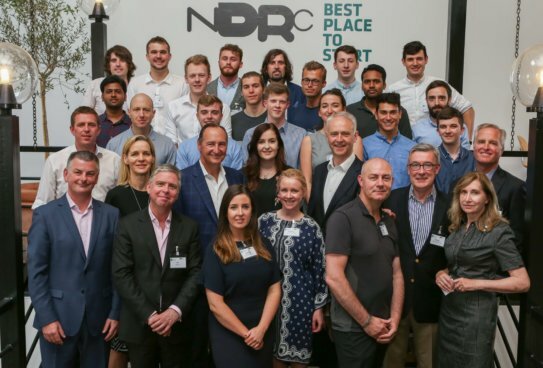 Ten business ideas will then be selected to receive mentoring and support from NDRC through a series of workshops during May and June, with the opportunity to compete to pitch for a place on one of NDRC’s investment programmes, €16,000 in prize money and other supports. Thanks and see you in April! Newer PostTCD Green Incubator Hits the Ground Running! Older PostWe're Hiring! LaunchBox Project Assistant (Two positions available)!